If you are the proud owner of a brand new iPhone 5s then there are a couple of settings that I think are "no-brainers". First off, if you have an iPhone 5s there really is no excuse for not having Touch ID enabled on your phone. Apple has really put some though into how to design this biometric technology into iOS and they do an excellent job of explaining how Touch ID works and how it doesn't save your fingerprint images. Don't be part of the 50% of the iPhone users that don't have any kind of passcode at all on your phone. If you are still concerned about "big brother" stealing your fingerprints I suggest you start filing off the tips of your fingers now and visit this site. All kidding aside, there are two settings that I highly recommend you change on your iPhone 5s once you enable Touch ID. The first setting you should change is to turn off Control Center Access from your lock screen. Now that you have Touch ID enabled it take no extra time to unlock your phone with your fingerprint than it does to wake your phone from sleep. Just press the home button to wake the phone and leave your finger against the surface of the home button while the phone wakes...boom you are in. Now take your finger and swipe up from the bottom of the screen and you are into Control Center. Why do this? Control Center gives you access to some basic controls of your phone and since it takes absolutely no extra time to lock them down it just makes sense to do so. Also, some of the lock screen vulnerabilites you have seen in the news go away when turn off Control center access from the lock screen. Although, if you are seriously concerned that someone is going to steal your phone and be able to sucessfully pull of the crazy set of maneuvers to get into your phone, then I again direct you to this helpful site. 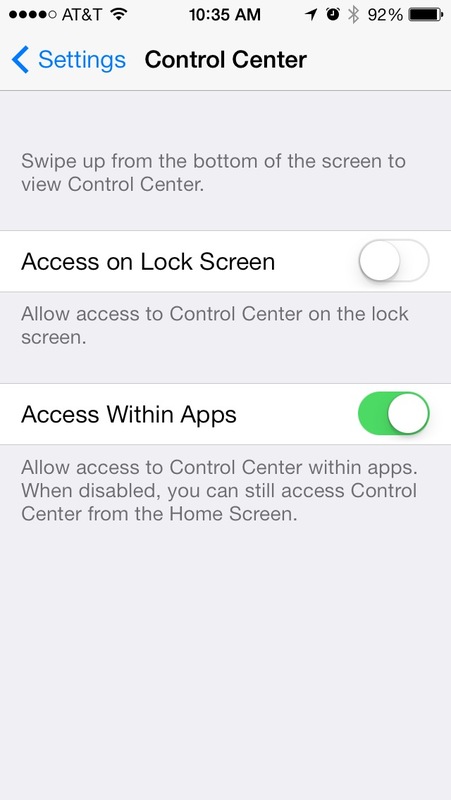 To turn off Control Center on the Lock Screen go to Settings and select the Control Center option. Within the Control Center menu toggle the Access on Lock Screen option to off (in the off position it will no longer be colored green as pictured below). The other setting that you should immediately change upon enabling Touch ID is to turn off access to Siri from the lock screen. Adam Christensen of the maccast talked about this vulnerability on his podcast (Show # 463). Show notes explain all the different kinds of personal information that can be accessed just by asking Siri a question from the lock screen. Again, with Touch ID enabled there is absolutely no reason to have Siri accessible from the lock screen. To turn off Siri access from the lock screen go to Settings and select Passcode and Fingerprint (note you will have to physically enter your passcode to enter this menu) and within that menu there is a group of settings called Allow Access When Locked. Toggle the Siri switch to off (in the off position it will no longer be colored green as pictured below).